VB-2HD is a highly moldable, lightweight vibration damping material. 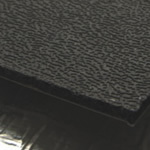 VB-2HD is a thick, lightweight and extremely moldable vinyl based vibration damping sheet material. VB-2HD is designed to mold and conform to highly irregular surfaces to achieve 100% bond and maximum damping performance. VB-2HD will stretch up to 70% to make an irregular surface appear as if it has been dipped in plastic. 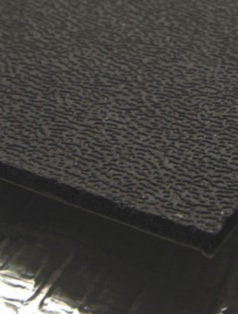 VB-2HD consists of a silica-mica and ceramic load suspended in a lightweight vinyl carrier. The VB-2HD product has been engineered to convert structural resonance (vibration) into low level heat through friction. The friction occurs as the silica-mica and ceramic platelets come in contact with each other as the substrate vibrates. One layer of VB-2HD damps 25% better than two layers of VB-2. Why? Two layers of VB-2 will have an adhesive layer sandwiched in between the two. One single, thick layer of VB-2HD eliminates this adhesive inter-layer which increases damping performance, reduces added weight, saves money and greatly reduces installation time. VB-2HD is ideally suited to create or replace a vapor barrier behind an interior door panel and because of its extreme moldability, is the perfect product to treat the underside of trunk lids. VB-2HD is much more dense than flimsy plastic making it much more capable of blocking airborne sound that normally enters the vehicle via the doors. VB-2HD also blocks speaker backwave and prevents an acoustical short circuit. Unlike any other product available on the market, VB-2HD may be painted to achieve the ultimate in cosmetic integration. For larger projects, consider purchasing VB-2HD in a three piece shop pack (VB-2HDSP). 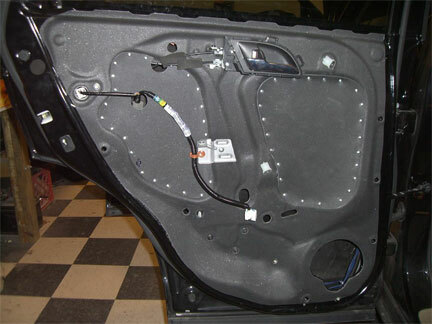 Toyota Tundra passenger door treated with VB-2HD. Honda CRV left rear door treated with VB-2HD.